I swear, come 4:30pm at our house my kids start to slowly transition from sweet and fun into HANGRY. So if I don’t have some sort of dinner prepped by then, I’m in trouble. I can always fall back on a tasty “wrap” idea on days like this. You can see all of my wrap recipes here . I have a lot of favorites :-). I get asked all the time what tortillas I use for my wraps. I LIVE for the tortilla land uncooked flour tortillas. I use them for any recipe you see on my site that requires a tortilla! 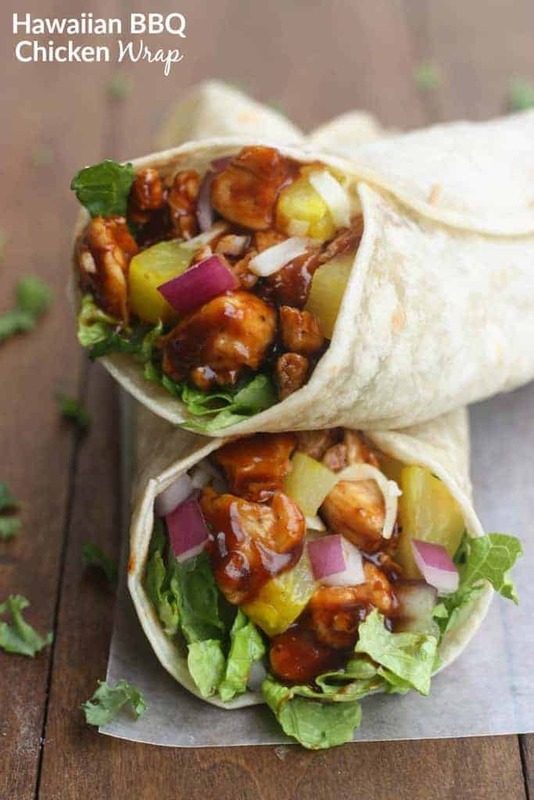 Let me tell you, these Hawaiian BBQ Chicken Wraps are just as delicious as they look. You can make your bbq sauce from scratch, or use your favorite bottled kind. I prefer Sweet Baby Rays Original BBQ Sauce. 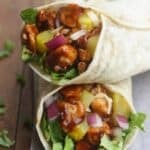 You can have these wraps made from fridge to table in 20 minutes or less. Perfect for an easy weeknight meal or even for lunch. Add chicken pieces to the pan and season with salt and pepper. Cook, flipping once until chicken is cooked through and golden brown. Remove pan from heat. Add barbecue sauce to the pan and toss chicken to coat. Place tortilla on a plate. 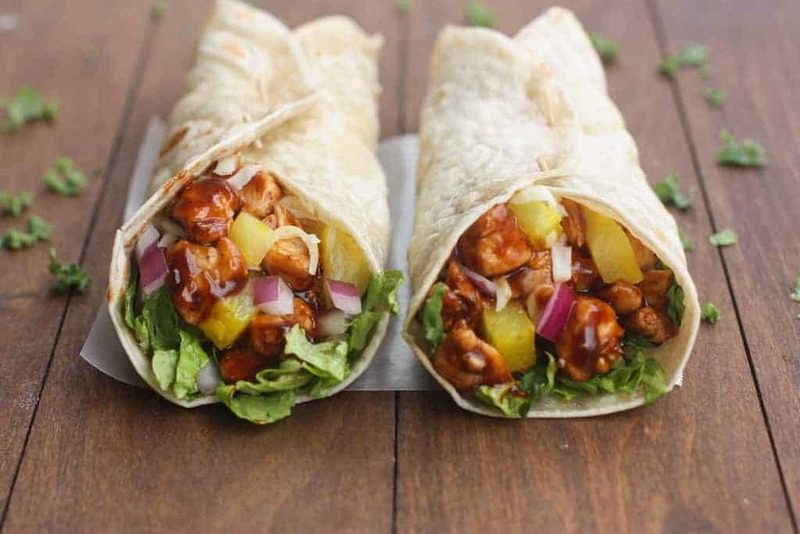 Layer with a spoonful of barbecue chicken, cheese, pineapple, onion, chopped romaine and cilantro. Roll, burrito style and secure with a toothpick. Serve immediately. Consider serving these with a BBQ side dish. I made this tonight and instead of cooking chicken, I used shredded chicken from a Costco rotisserie chicken and just heated it up in a pan with some oil and then added Siracha BBQ sauce from Trader Joe’s. Thanks for the recipe!! It’s def going on repeat! Great summer meal. Easy…not a lot of dishes and my husband and I kept wanting more!! The taste is awesome. I love this recipe. Tried for my friends to check out and they loved the recipe too. Why is this not called a burrito when thats pretty much what it is?